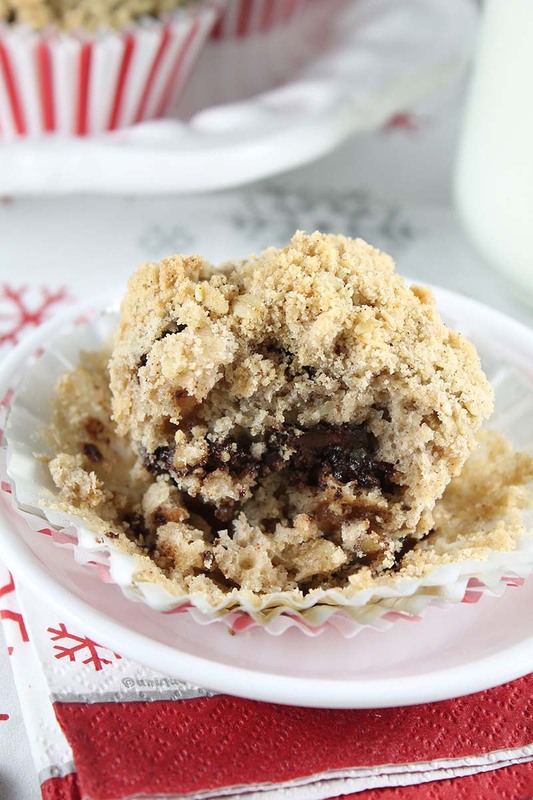 Studded with chunks of chocolate & walnuts and topped with a cinnamon-streusel topping, these delightfully delicious muffins are an amazing treat for breakfast, brunch or snacking. Line 12 muffin cups and set aside. Add flour, yeast, sugar, salt and cinnamon into a mixer bowl fitted with a paddle. Mix on low speed until well combined. Add buttermilk, melted butter and egg; mix on medium speed until well combined. Fold in chocolate chunks and walnuts. Spoon evenly into lined muffin tin. Prepare topping: Mix together all of the streusel topping ingredients until crumbled. Sprinkle over muffin batter. Cover and allow to rise 45 minutes to 1 hour. Bake for 25-30 minutes or until a toothpick inserted comes out mostly clean.